Fish and Chips Arrive in Vilamarxant! I can scarcely believe it myself but Britain’s third favourite meal fish and chips, ( latest survey April 2009 ) after Chow Mein and Chicken Tikka Masala has finally arrived in Vilamarxant and today around 55 Brits turned up to give their approval to the latest dish on the menu at Don Raffaello Pizza Bar and Restaurant in the Avenue 2 de Mayo! Over the last few months there has been a quiet revolution on this square in the centre of town dominated by the refurbished town hall. The old Jinconenca ( or ice cream bar ) closed and was gutted before extensive refurbishment as the Cerveceria Blanca, recently re-opening with a flourish and beer from Cruzcampo. Earlier, the old Che Guevara bar, itself also formerly home to a pizzeria, was similarly re-branded as the Pizzeria Don Rafaello, under the managership of Saiid, a Moroccan with good English and a willingness to please his customers. The old Meson del Jamon ( much-loved by the earliest Brits in town ) appears to be in a state of semi closure. 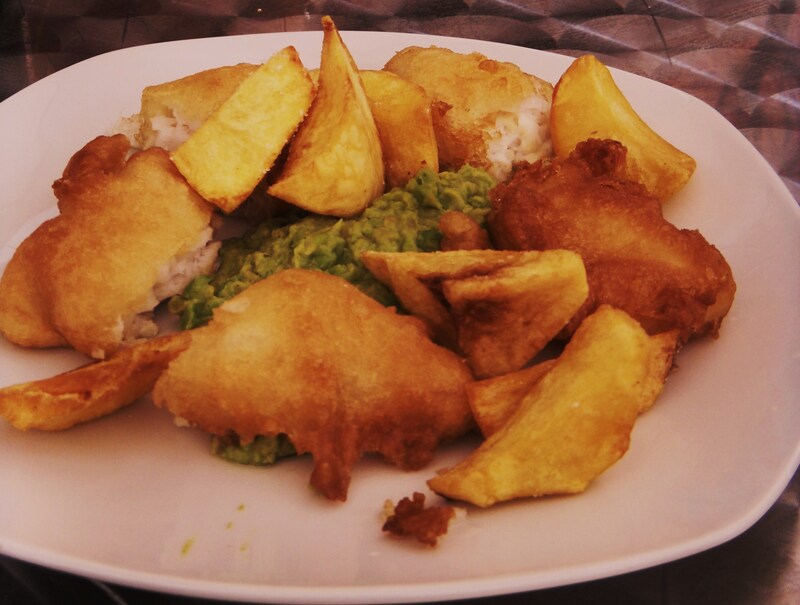 Fish and Chips and Mushy Peas! What or who lies behind these initiatives in the midst of the financial crisis? 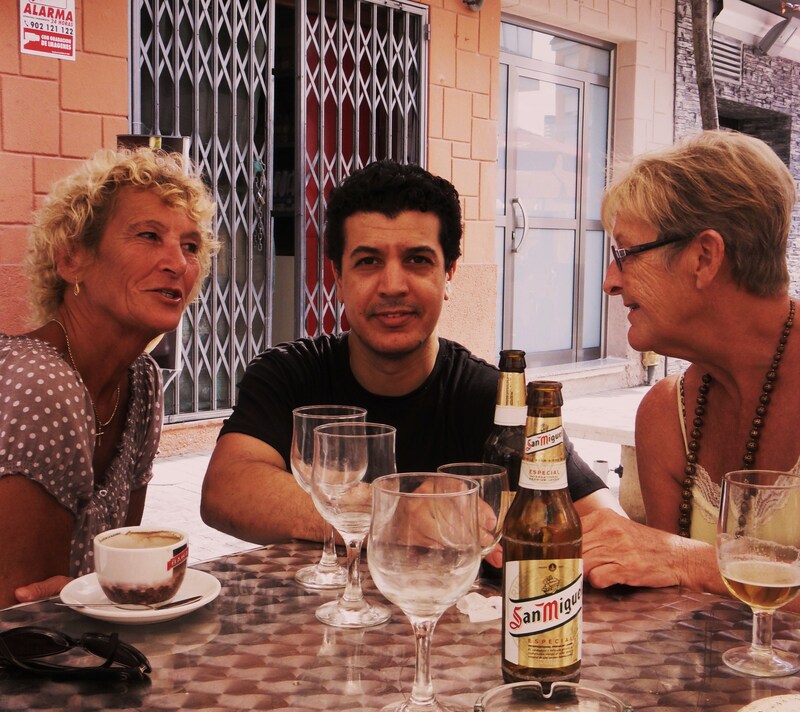 The answer of course is entrepreneur Rafa whose Casa Arago cerveceria and catering empire is undergoing expansion and rationalisation at the same time, all of it providing his clients with greater choice and variety. All the establishments named above are part of this empire. Saiids friendly nature quickly made his customer base grow and his ability to cook a variety of dishes to order has made the bar very popular . Amongst those first attracted were Basil and Pip Smith, Vilamarxant´s longest English residents in the town. Not many people may know but they were fish and chip shop owners before moving here and it was they who showed Saiid how to cook and present this classic English takeaway dish. Their legendary Wisbech shop is now sadly missed there! Lucky friends are regularly invited to their home where Basil keeps his hand in with his twin deep fat friers using only best beef dripping! Saiid flanked by Val and Annie. Saiid has quietly honed his skills before launching it onto the `menu del dia´as a main course option and today was chosen to invite a wide-ranging group of Brits from as far away as Macastre and Pedralba to a free launch. Served in tapas style for sharing Saiid started with a plate of Carrillada, succulent pigs cheek cooked slowly and a favourite on the restaurant’s menu. This was followed by the plate of fish and chips, crisp batter, fresh flaky and moist hake, mushy peas and crisp chips with perfect centres! Saiid finished with a soft cheese drizzled with concentrated sherry vinegar and portions of the pizzas which are popular already in the town. 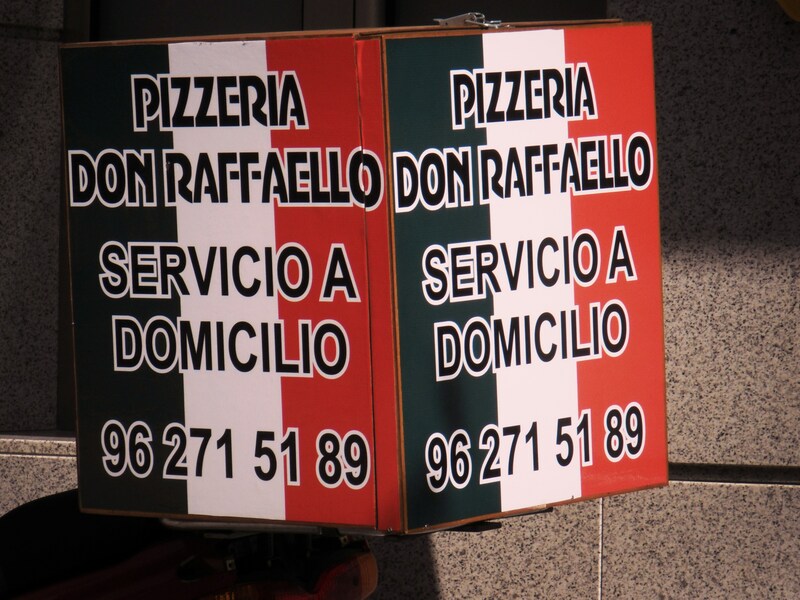 Judging by the reaction this little bar ( popular with the Spanish as well) will be getting a lot more custom from this group in the future as well as for it´s growing pizza market ( there are 22 varieties to choose from ranging between 6 and 8 Euros ). All the pizzas are cooked in a wood oven and can be ordered for takeaway. It is better to pre-order if you want fish and chips to avoid being disappointed and Saiid will also cook authentic Moroccan tagines to order as well for those looking for a little more variety in their mediterranean meal choice. This will not be the last initiative either from Rafa and Casa Arago. I understand Pedralba´s British community are celebrating Halloween at the end of October with a paella ( Britain’s fourth favourite dish?) and karaoke in Bar Tibu, opposite the village´s health centre. Welcome to the `Friery´, Saiid ( collective noun for Fish Friers) and who would have thought it , nobody told Derek Workman who thinks nothing ever happens in Vilamarxant? !